That’s it! 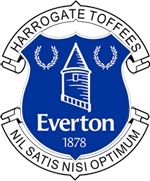 – Harrogate and District Everton Supporters Club Harrogate and District Everton Supporters Club | That’s it! So, we’ve reached the end of what turned out to be a disappointing season. It certainly didn’t deliver what we expected following the great showing last year but at the very least we did have a European adventure! All members should keep an eye on emails during the close-season for information relating to next seasons Supporters Club membership. Details will be published as soon as possible. Here’s looking to season 2015/2016 and have a great summer.